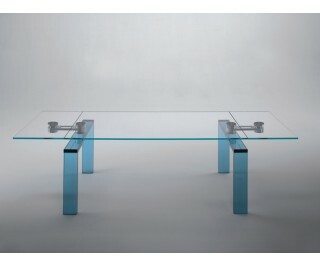 Extendable table with top and extensions in tempered crystal glass (thickness 15 mm) in float transparent or extra-clear versions. The mechanism made of stainless steel and aluminum with brill finish, allows the rotation of extensions and their lifting and lowering. The removable legs (size cm. 4 x 13) are characterized by a particular and innovative welding system made by jointing three superimposed glass sheets of crystal glass and are available in four different finishes. Bluenote is available in two different sizes.